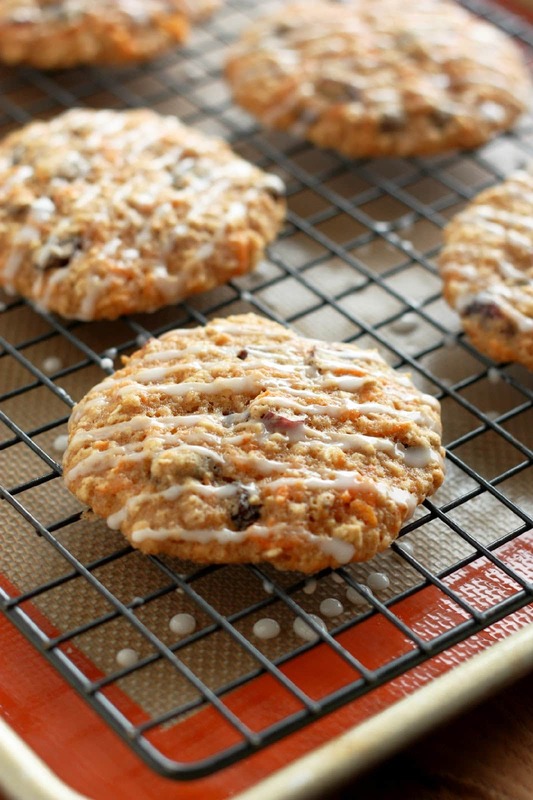 Carrot Oat Cookies – these are full of fiber, antioxidants and vitamins. They are also low in fat. 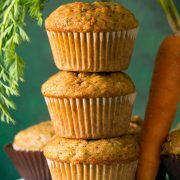 I created this recipe because I happened to only have 1/4 cup butter in my fridge so I had to improvise and try something a little healthier. 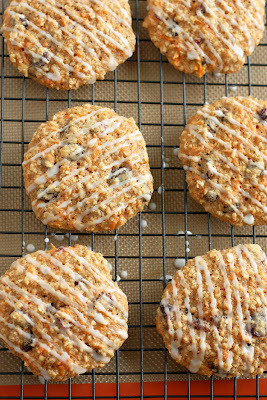 I’m so excited about how delicious they are! I need, yes need, dessert everyday or it’s just not a great day for me =). Sort of a problem, but not now with these. These moist, cake like cookies melt in your mouth! The glaze is totally optional, I mostly added it for looks so feel free to leave it off. Also if you wanted to you could ice them with a low-fat or even fat free cream cheese icing. A cookie made with less fat, oats, whole wheat flour, carrots and applesauce. Reduce the sugar by up to 1/2 cup if desired. Preheat oven to 350 degrees. In a mixing bowl whisk together all-purpose flour, whole wheat flour, baking powder, baking soda, cinnamon, optional nutmeg and salt, set aside. In the bowl of an electric mixer, whip together applesauce, butter, brown sugar and granulated sugar until well blended and smooth about 1 minute. Stir in egg and vanilla. Slowly add in flour mixture. 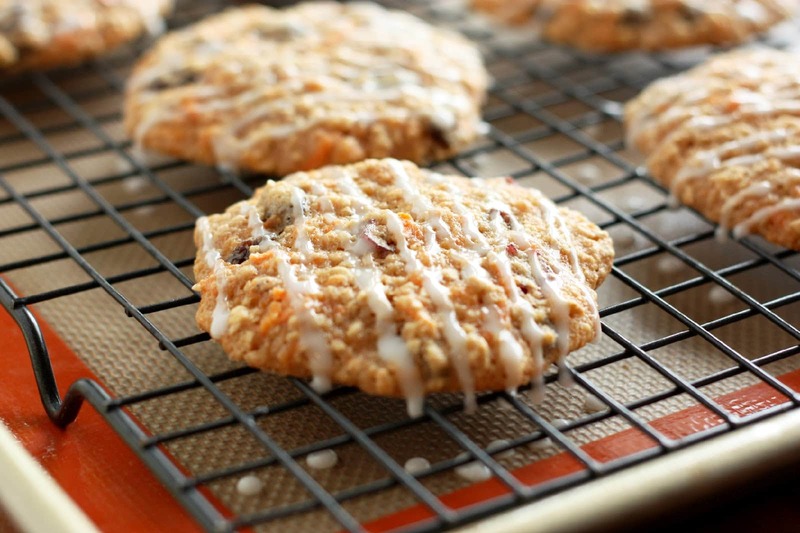 Stir in quick oats, carrots, raisins and dried cranberries, mix until combine. 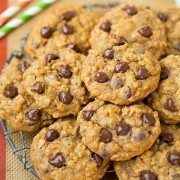 Drop mixture by heaping tablespoon fulls onto a Silpat lined cookie sheet two inches apart and bake for 15 minutes until lightly golden and set. Allow to cool several minutes before removing to wire rack to cool. If using glaze: in a small mixing bowl, whisk together powdered sugar and milk until well combine and smooth. 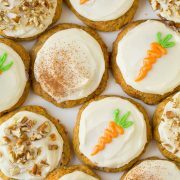 Pour into a piping or ziploc bag, snip a small tip off the end and pipe over cookies (note: store cookies in a single layer). « Monkey Bread Muffins… quite possibly the best thing I’ve ever eaten!